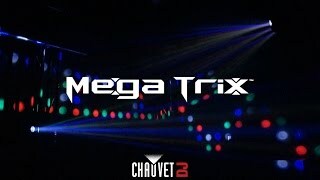 The Chauvet Mega Trix LED FX light is equipped with 192 RGBW LEDs. This party light is a lightweight DMX effect light that projects animations from pod to pod for a very unique look with no moving parts. Super-crisp optics create dazzling mid-air effects and sharp beams of light that cover a large area. Ideal for parties of all ages!